In a stunning report based on data obtained through the Freedom of Information Act, The Center for Immigration Studies has revealed that the Obama administration has been flooding the United States with work permits not authorized by law for millions of people. Government data reveal that about 5.5 million new work permits were issued to aliens from 2009 to 2014, above and beyond the number of new green card and temporary worker admissions in those years. This is a huge parallel immigrant work authorization system outside the limits set by Congress that inevitably impacts opportunities for U.S. workers, damages the integrity of the immigration system, and encourages illegal immigration. The remarkable number of work permits granted by the federal government to law-breaking aliens better explains how all net jobs growth since 2007 has gone to immigrants. Approximately 1.8 million new work permits were issued to aliens with temporary visas or those who entered under the Visa Waiver Program. Of these, about 1.2 million (67 percent) had a visa status for which employment is not authorized by law. For example, more than 470,000 work permits were issued to aliens on tourist visas and 532,000 were issued to foreign students. More than 156,000 were issued to dependents of students and guestworkers, all in categories not authorized for employment by law. In addition, 963,000 new work permits were issued to aliens who have been granted permanent status or have a status that will lead to a green card. These are primarily refugees (418,000), fiancés of U.S. citizens (164,000), and approved asylum applicants (174,000). About 982,000 new work permits were issued in this time period to illegal aliens or aliens unqualified for admission. Of these, 957,000 were aliens who crossed the border illegally (Entered Without Inspection). Inexplicably, 1,200 new work permits were issued to aliens who were denied asylum, were suspected of using fraudulent documents, were stowaways, or were refused at a port of entry. A huge number of work permits, 1.7 million, were issued to aliens whose status was unknown, not recorded by the adjudicator, or not disclosed by U.S. Citizenship and Immigration Services (USCIS), the agency that processes the applications. This should be a concern; work permits are gateway documents to driver’s licenses and other benefits, and if the government agency issuing them does not know or will not disclose how the bearer arrived in the country how can others rely on the authenticity of an individual’s identity? It is equally disconcerting if the government does know and chooses not to disclose it. You can count on the so-called “civil rights” leaders like Sharpton to completely ignore the impact of millions of job entrants on the wages available to African-Americans. And you probably won’t be seeing much on the subject on NBC Nightly News, either. This morning, it was reported that many U.S. Border Patrol agents have had their M4 carbines taken away from them, and agents along the U.S.-Mexican border are actually being forced to share weapons. What is behind this outrageous confiscation? Officially, the U.S. Customs and Border Protection (CBP) agency has called for a nationwide inspection of the agents’ weapons, and have yet to return them. However, this action is unprecedented and agents are beginning to go public with their concerns for their own safety. There’s a lot of agents that are pretty upset over it. We know it’s a dangerous job. We know what we signed on for but we want to have as much of the equipment as we need to perform the job. I hope they replace these weapons as soon as possible or give us some kind of answer as to how they plan on replacing them. Considering the fact that the Obama administration has been purchasing large quantities of both weapons and ammunition over the last two years, and doling out automatic weapons and armored vehicles to local law enforcement agencies, it is simply inconceivable that the federal government is unable to repair or replace our Border Patrol agents’ weapons. Furthermore, if the rifles were truly “unserviceable” as the feds claim, the agents would not have been carrying them in the first place. Every law enforcement officer who has ever worked a shift checks his/her weapon before going out on patrol, and the men and women of the Border Patrol are no exception. More than likely, this is being done by the Obama administration for political reasons, at Mexico’s request. Do you think the cartels are disarming their soldiers? To deal with Obama’s minimum wage orders, McDonalds replaces staff with robots. McDonald’s has decided to take the bull by the horns, so to speak, and deal with the issue of a higher minimum wage. At their recent stockholders meeting, the company admitted that they would, sooner or later, have to deal with the reality of such a minimum pay requirement. They also said that such a wage was impossible for their franchisees to pay to workers and still remain competitive in the area of price. As a result, the company has announced that starting late next year they will start replacing personnel with Auto Clerks. No longer will you see the familiar uniforms standing behind the counter with smiling faces when you enter the store. Hence forth, all front counter staff will be replaced with computerized clerks. The automated clerks will look similar to the familiar ATM machines we all use every day. There will be one white shirted “Crew Leader” behind the counter, but his only job will be to make sure the Auto Clerks keep functioning and oversee cleanups. When you enter, you will simply give your order to the Auto Clerk by punching in the pictures of what you want on a touch screen. The Auto Clerk will then calculate the cost of the items, send the order to the kitchen, assign you a number, and take your money. You will be able to use cash, or credit and debit cards. You will get your own drinks, napkins and condiments just like you do now. The savings to the company is obvious, instead of having 10 workers standing around making 7.50 an hour, there will be two persons in the kitchen filling the orders, and a manager keeping things running smooth. Total cost to the store owner is 48.00 per hour. Under the old system, the cost would be over 80.00 per hour. Of course there will be a net loss of 70% of the jobs in the restaurant, but as Hillary Clinton recently said, “private business doesn’t create jobs.” The change will allow the company to remain competitive for the next 15 to 20 years. Part of this story is satire, part is not. Do some research and find out which is which. We couldn’t make it up if we tried, and as unbelievable as it may sound, a number of Republican leaders in Congress are so anxious to give Barack Obama the funding he so desperately needs to implement his lawless and dictatorial amnesty decree that they’re scrambling to make up clumsy lies in an attempt to deceive you into believing that they’re “powerless” to stop him. But they’re NOT powerless to stop Barack Obama and, as a matter of fact, rank-and-file Republicans are already in open rebellion over this latest clumsy lie. These rank-and-file Republicans desperately need your help… Representative Michele Bachmann and others are even planning a rally in Washington D.C. and are urging patriotic Americans to “melt the phone lines” in Washington. We must heed this clarion call. Our elected officials need to hear the righteous indignation of patriotic Americans and they need to hear it now. Use the hyperlink below to send your urgent Blast Faxes to each and every Republican Leader of the United States Senate and United States House of Representatives. Or alternatively, send your urgent Blast Faxes to each and every Member of the U.S. Senate and U.S. House of Representatives. You read that right. Congress is powerless to stop Barack Obama because doing so would require an act of Congress? If you’re seeing red over this pathetic excuse, you’re not the only one. Obama’s excuse for his illegal amnesty will be that the immigration system is “broken” forcing him to act. But when Obama says that the system is broken, he means that some parts of it still work and so he intends to break immigration all the way through to benefit his own corrupt political allies. That will hurt his own voters the most, but the Democratic Party has a notoriously masochistic relationship with its voting base. It beats them up and then it gaslights them by hugging them and telling them that it was really the mean Republicans who punched them in the face. When African-American unemployment rates rise, the workers who can’t find jobs because of all the brand new DREAMERs won’t blame the White House, they’ll blame the evil Republicans for income inequality, assuming Sharpton manages to read the term correctly from his MSNBC teleprompter. According to Obama our immigration system is broken because it doesn’t allow illegal aliens who illegally crossed the border to take American jobs. That’s not a broken system, that’s what the system is supposed to do. When illegal aliens aren’t allowed to legally take American jobs, that’s how you know the immigration system is working. In the language of progressivism, helping means ruining and fixing means breaking. A system that fulfills any useful purpose must be reformed out of all usefulness. If the tattered shreds of the immigration system still keep a single Democratic voter from legally cashing a welfare check and casting a vote, then immigration must be reformed and helped and fixed until it is completely destroyed. The immigration system is broken because it was reformed so many times that it makes as much sense as an outhouse on a space shuttle. Its main function now is to bring millions of people without jobs to a country where millions are out of work. Obama wants to fix that by adding millions more people. Our system of immigration is a perfectly good system for importing lots of low wage workers. The only problem is they’re being imported into a country where there are a lot more low wage workers than there are jobs. The cost of providing food stamps and social services for the immigrants and the Americans they put out of work is passed on to the shrinking middle class which kills more jobs. Some Republicans would like to modify it to help Mark Zuckerberg bring cheaper third world programmers and engineers to replace the Americans over at Facebook. Why settle for just wiping out the working class, when you can also take out chunks of the middle class? Our immigration system made perfect sense back when we were opening factories everywhere. It made sense when new ranches needed hands and land needed working. It makes a lot less sense when the government is fighting a war on carbon, when ranches have to get out of the way of the spotted red toad and farms are starved of water in the name of the environment. The million immigrants a year are not entering booming industries, but serving as cheap labor in declining ones. And they’re doing it in a country where declining industries and poor workers are already being subsidized by taxpayers in a dozen different ways. Why then should taxpayers also be subsidizing the replacement of American workers with Somali and Honduran workers? Who benefits from that except the Democratic Party which not only killed the industries, but is now managing to kill the American workforce? The glorious future of the new economy is a government subsidized Chinese factory using foreign workers to make subsidized solar panels in Oklahoma while taxpayers remain on the hook for the subsidies which used bonds sold to Chinese investors. Declining industries tighten their belts by cutting costs. They find the cheapest employees they can. Those cheapest employees become a constituency for the nanny state. The nanny state makes it even more expensive to operate. The cycle spins on until the only industries left are state subsidized and everyone directly or indirectly works for the state. And the only items of collateral with which to borrow more money to subsidize them with are the land and the people. That’s not America. That’s Africa. The Obama economy has created mostly low wage jobs. Those jobs continue to be filled by immigrants. There still aren’t enough jobs so Obama is proposing to create even less jobs by adding more immigrants by legalizing more illegal aliens. 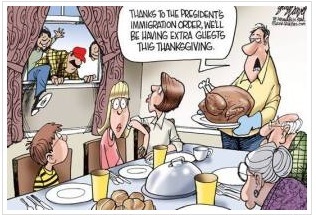 There is something broken here, but it’s not so much immigration as Obama and his party. Last week I spoke to a British immigration lawyer who described how difficult it was for seniors in the United Kingdom to retire in the United States. While most countries welcome wealthy retirees, our system makes it difficult for them to move and bring their money over here. Meanwhile in his 2013 State of the Union address, Obama had praised Desiline Victor, a 102-year-old Haitian woman who had moved to the United States at around 80 and never learned to speak English, but did spend hours waiting in line in Florida to vote for Obama. There are plenty of senior immigrants coming through family reunification for a big bite of a social welfare system they never paid into. But the Democratic Party would rather have a voter than a worker. And so what we have is not an immigration system, but a migration system. America certainly takes in plenty of needy people, but what the New York Times is emphasizing is that we should be taking in people with nothing to contribute and keeping out those who do. Its ideal immigrant will at best be a low wage worker and at worst a permanent welfare case. We don’t want Cuban doctors. We want Somali muggers and Liberian Ebola cases and Pakistani terrorists. Immigration is not meant to serve American interests. America is meant to serve immigration. The end result of this immigration policy will be a stratified society with a permanent lower class and a thin upper class whose leftists can always start a riot by shouting about income equality without ever being able to offer it. Without social mobility what we will have left is social instability. There will be lots of young men with time on their hands to build bombs or throw stones. If the left doesn’t win through the system, they’ll have their revolutionary constituency standing by. The only way we can afford the immigration policy that we have now is with a lot more industry and a lot less welfare. 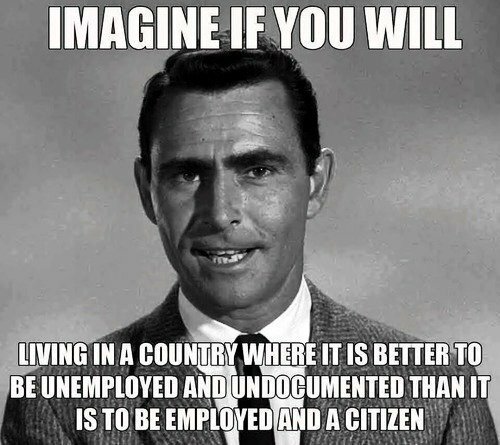 Instead our immigration rates were widened and rerouted to the Third World even as our actual industries declined. We kept on taking workers we didn’t have jobs for. We built ghettoes and rust belts and our politicians kept on reciting robotic speeches about being a nation of immigrants. Immigration requires opportunity. We still have it, but less of it than we used to. Our immigration system is not based on opportunity. It’s based on a migratory flow of Democratic Party voters. What broke the system was making it as open as possible to those who had the least to offer while closing it tightly to those who had the most to offer. Now Obama wants to import illegal aliens while deporting American jobs. He wants to trade American jobs to illegal aliens for Democratic votes. If the immigration system is to work again, it should work for America… not for Obama. Obama argued that we needed to legalize illegal aliens so they can pay taxes. This occasionally fools people who ought to know better because they forget that by “pay taxes” he means receive taxes. Illegal immigrants will receive huge payments from American taxpayers under rules now being imposed by President Barack Obama’s unilateral amnesty. The illegals will get work-permits and Social Security cards, and will be required to pay taxes, according to Cecilia Munoz, the former immigration lobbyist who is now a top Obama aide. That means they’re part of the tax system, she said, when she was asked if the illegals would get annual payments under the Earned Income Tax Credit program. “They are subject to our tax law,” she said, carefully. According to the Internal Revenue Service, two parents with three or more children would receive up to $6,143 in 2014 if they earn less than $46,997. A family with two kids, and an income of $20,000, would receive $14,590 in taxpayer funds this year alone. That money will be coming out of the pockets of Americans whose jobs those same illegals will be taking. How many billions in earned income credits will the 5 million illegal aliens be receiving? Daniel Greenfield, a Shillman Journalism Fellow at the Freedom Center, is a New York writer focusing on radical Islam. He is completing a book on the international challenges America faces in the 21st century. 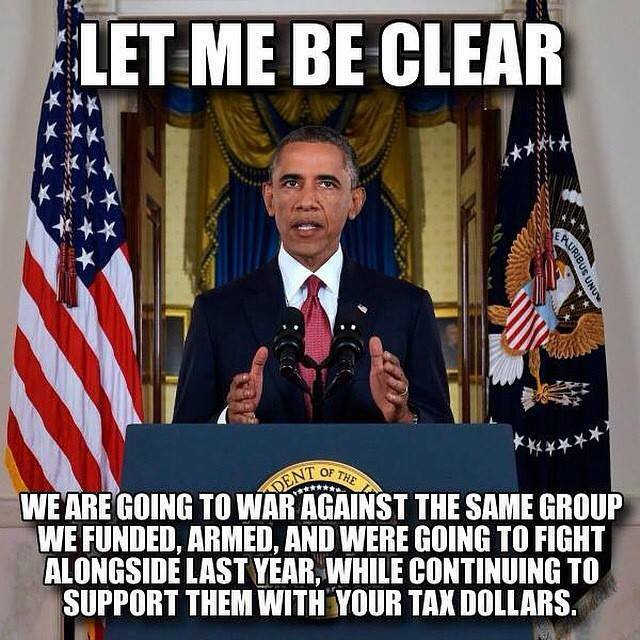 OBAMA’S WWIII PLOT RESURRECTED, NOW WITH GOP SUPPORT! The last time Obama tried to get the US to agree to invade Syria, Russia’s Vlad Putin threatened to nuke us for it, and most Americans voiced their disapproval of it anyway. Now it’s back on. We all know Barack Obama doesn’t care about America by now, but this is low even by his despicable standards. Yep, if it weren’t so sad, it would have to be funny. In the middle of the greatest energy extraction, production and (if he weren’t doing everything in his power to block it) exportation era in American history, everyone’s favorite legal scholar is looking to drive us directly back into a Depression. Apparently, with oil prices plummeting and the dollar showing signs of life for the first time in almost a decade, Obama thinks that now is the time to move away from our greatest economic strength. Americans are loathe to believe that a president could have dishonorable intentions towards his own country. But when that president repeatedly – over the course of years – takes actions that defy the majority of the people and actually do them harm, then we are left to deal with a sobering reality: We do not have an ally in the White House. Such is the case with Barack Hussein Obama, and it is a recent agreement he has made with the Chinese government that lays bare his disdain for We the People. In Beijing this week for an Asian economic summit, Obama and Chinese President Xi Jinping agreed to new greenhouse gas reduction emissions that are going to be hugely detrimental to our country, while essentially giving a rising competitor and adversary a pass. The result will be that China’s economy continues to grow while more and more average Chinese prosper; Americans, meanwhile, will take a huge hit to our economy, which will cost us even more jobs and opportunity, while further diminishing our gross domestic product. On Wednesday, Obama announced that the U.S. will establish new emission reduction goals by more than a quarter of current levels – between 26 and 28 percent – over the next 11 years, part of a climate change/global warming agreement despite that facts that a) there is no scientific evidence to prove that planet is warming; and b) Chinese industrial emissions are the worst on the planet (ever try to take a clean breath in the nation’s capital?). The new target is a drastic increase from earlier in Obama’s presidency, when he pledged to cut emissions by 17 percent by 2020. By contrast, Obama’s counterpart, Xi Jinping, did not pledge any reductions by a specific date, but rather set a target for China’s emissions to peak by 2030, or earlier if possible. Xi also pledged to increase the share of energy that China will derive from sources other than fossil fuels. China’s emissions have grown in recent years due to the building of new coal plants. No, it shows what’s possible when a U.S. president’s political ideology is so tainted towards his own country that he will do anything to undermine it; after all, China accounts for nearly one-third of the planet’s harmful emissions. In January 2008, before the editorial board of the uber-liberal San Francisco Chronicle, Obama discussed a cap-and-trade emissions plan of his which would dramatically affect the majority of U.S. power plants (which are coal-fired or run on natural gas), leading to “electricity rates [that] would necessarily skyrocket.” Why would an American president purposely impose rules and regulations on an industry to the point that it hurts national competitiveness and energy production while at the same time raising the cost of power for the people – especially in the absence of hard evidence and scientific data proving such plants are causing extensive (as in, global) environmental damage? Answer: Obama’s left-wing ideology is more important than your ability to pay your electric bill or heat/cool your home. Imposed – with complete Democrat control of both chambers of Congress – the Affordable Care Act, after knowingly, wittingly and willingly lying about everything regarding the law’s advertised objectives (cheaper insurance rates; keep your current plan and doctor; universal coverage; etc.). This amounts to a government take-over of about one-sixth of the U.S. economy, and imposes strict government rules and regulations regarding the people’s health care from cradle to grave. The result has been a) higher insurance premiums; higher out-of-pocket expenses and deductibles (Josh Archambault, director of health care policy & program manager for the Middle Cities Initiative at the Pioneer Institute: “Most insurers have been changing their insurance plan designs dramatically under the federal law. Narrow networks, higher deductibles, and higher out of pocket costs when you visit a doctor are the new norm. In other words for many Americans under Obamacare, they are paying more and getting less.) Why would a U.S. president impose such an onerous, costly, industry-killing law on the country? Answer: Obama’s left-wing ideology is more important than your right to make your own health care choices, at prices you can afford. The 2015 Obama budget so dramatically cuts the U.S. military that estimates would put it back to pre-World War II levels. “You look at what happened at the end of World War II. We took the largest, strongest Army, Navy and Air Force that had ever been on the earth, and we destroyed it, totally eliminated it for the next year,” said House Armed Services Committee Chairman Rep. Buck McKeon, R-Calif. “So when Korea started, they pushed us almost right into the ocean. They were basically fodder trying to hold things back.” Adds Army chief of Staff Gen. Ray Odierno: “It’s easy to say, well, I just don’t see us having another conflict again. Well, I heard that in 1980. I heard that in 1990. And I heard that in 2000. And yet we are constantly engaged.” Adds Nora Bensahel, senior fellow at the Center for a New American Security: “It will be much more difficult if the nation’s military forces are asked to fight a large and ongoing ground war, and it will be more expensive to do so in blood and treasure. We can do anything, but it will be far harder and more people will die.” And this, during a period of Russian and Chinese resurgence and ascension. Why would a U.S. president purposely weaken his own country in the face of rising threats? Answer: Obama’s left-wing ideology and anti-American sentimentality call for defense policies that put us on par with, not ahead of, potential adversaries. As for the current lopsided emissions deal with Beijing – a deal that The Associated Press reported was the result of “months” of “secret talks” – it may just be one of Obama’s “final acts” of hostility against the very country that elected him president twice. “This unrealistic plan, that the president would dump on his successor, would ensure higher utility rates and far fewer jobs,” said incoming Senate Majority Leader Mitch McConnell, R-Ky, in a statement. Next up: Executive amnesty, which Sen. Jeff Sessions, R-Alabama, says ought to be the final straw – which will result in “legalizing” millions who came here illegally, as well as opening our doors to millions more foreign “workers” at a time when a record number of Americans are completely out of the work force (thanks to, in large part, Obama’s gutting of the work requirement in the 1996 welfare reform law…but that’s another column for another day). Let’s finance the cleanup of China’s polluted skies and destroy our own economy at the same time so that a few of Obama’s billionaire buddies can profit. Let your voice be heard on this subject, lest your soon-to-be Chinese government landlords foreclose on your Free Speech rights. An Obama Amnesty Decree Is Imminent… Obama Caught Covertly Planning To ‘Legalize’ Up To 34 Million Illegal Aliens! Jessica Vaughan, a former State Department officer, who is now an immigration expert at the Center for Immigration Studies, blew the lid off of Barack Obama’s covert Amnesty scheme when she exposed an October 6, 2014 bid solicitation, issued by the U.S. Citizenship and Immigration Services (USCIS), seeking a vendor who can produce up to 34 million blank green cards and work permits. And Senator Sessions issued the following clarion call: “You have the power to send a bolt of lightning that will send shock waves through Washington DC. You have the power to tell Obama and his open borders extremists: NO.” But time is short. Unless you take action now, you can be sure that Barack Obama will attempt to pull the trigger on his massive covert amnesty scheme after next week’s election. Use the hyperlink below to send your urgent Blast Faxes to every Member of the Republican Leadership. Or alternatively, send your urgent Blast Faxes to each and every Republican Member of the United States Senate and the United States House of Representatives. It’s No Secret… The Implementation Of A Large-Scale Executive Amnesty Has Already Begun. Of course, the Obama Regime is already trying to tell us that 34 million blank green cards does not necessarily translate to legalizing 34 million illegal aliens… and they’re right. History teaches us that legalizing millions of illegal aliens will only give the green light to an even greater number who will follow. It’s likely that Barack Obama actually wants to encourage MILLIONS of additional illegal aliens, beyond the 34 million, to come into the United States. So here are some legitimate questions: If the illegal alien population increased from 2.7 million to 10-12 million after we enacted the last amnesty, what will happen if Barack Obama is permitted — against the will of Congress and the American people — to legalize up to 34 million illegal aliens now? How many tens of millions more will follow in anticipation of the next amnesty? Do not deceive yourself, if we allow Barack Obama to get away with this covert amnesty scheme, the floodgates will open. We can’t let him get away with it. We must fight. Did you know that almost 900,000 illegal aliens who are facing final deportation orders are still in the United States? Did you know that approximately 167,000 of them are convicted criminals who were released by ICE and are presently roaming our streets? “‘Prosecutorial discretion as practiced by the Obama administration has transformed immigration enforcement into a massive catch-and-release program that makes a joke of the law, fails to deter illegal settlement, and allows even illegal aliens who commit crimes to remain here,’ Vaughan said Wednesday. And understand, Vaughan is not saying that 167,000 of the illegal aliens in this country are convicted criminals. Oh no… she’s saying that ICE had custody of 167,000 convicted criminals who were simply released back into our cities and towns even though the federal government had every legal right to immediately deport them. So, here’s a question: How many convicted criminals will be roaming our streets once Barack Obama opens the floodgates with his covert Amnesty scheme? One thing is certain, we don’t know the answer and we certainly don’t want to find out. The Open Secret That No One In Washington Dares To Acknowledge… At Least Not Publicly. 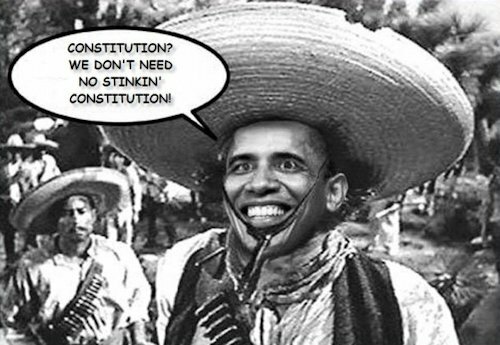 Barack Obama’s covert amnesty plan has NOTHING to do with immigration. … Just as ObamaCare — which, as even the unwashed masses are starting to figure out — had nothing to do with making health care more affordable and available. It’s really all about control. It’s about growing the scope, size and power of the federal government. It’s all about overwhelming our already overburdened social welfare system. And it’s about driving down wages, increasing taxes and growing the number of people dependent on the federal government. The above is not the unfortunate consequence of a massive amnesty… it’s the purpose. … The problem is your children and grandchildren will become overly dependent upon the largess of a federal government that is too big and too intrusive as well. This covert Amnesty scheme must be stopped and only patriotic Americans like you have the power to stop it. I’m sure you’ve been following the news out of New York, and contrary to what President Obama and other top government officials have said, the Ebola crisis appears to be getting worse in the U.S. Judicial Watch is striving to pry loose the truth from reticent federal agencies that have a responsibility for public safety and our national security. We have filed Freedom of Information Act (FOIA) requests with the Department of Defense (DOD) and the Occupational Safety and Health Administration. In light of the potential danger from this deadly disease, the administration’s long history of delaying and obstructing information requests could have severe consequences for members of the public who have been told that they are safe. We are prepared to go to court to force the release of critical pieces of information. Our Ebola FOIA requests ask for an immediate clarification of the DOD’s plans for the evacuation of U.S. personnel from Africa if an Ebola outbreak occurs. We are also looking for information from OSHA regarding any plans the agency has for responding to the current Ebola outbreak and any expressions of concern by OHSA personnel. Another key player here is a cryptic carrier known as Phoenix Air. We know this air carrier has been responsible for transporting Ebola victims, but that’s all the American people are being told. How safe is Phoenix Air and what kind of relationship does it have with the U.S. government? This much seems clear: Phoenix Air is more than just a medical transport unit. It appears to have significant DOD contracts. One definitive move the administration made that is worth noting is the recent appointment of Ronald Klain as the Ebola czar. JW has carefully documented the constitutional problems with the appointment of congressionally unaccountable czars throughout various executive agencies. But there’s an additional problem with Klain’s appointment. His appears to be motivated more by politics and less by qualifications. Klain is not an expert in infectious diseases. He is a long-time Democratic operative who gained notoriety for his role in the legal challenges surrounding the 2000 presidential election. Klain also previously served as the chief of staff to Vice-Presidents Al Gore and Joe Biden. He’s what you call well-connected in Washington. For the rest of America, “well-connected” can be translated as “corrupt” in this case. Klain’s involvement in Solyndra and the Clinton-era fundraising scams show just how well-credentialed and well-suited he is to represent President Obama. True to form, Klain’s appointment shows that the Obama White House views the Ebola issue as more of a political crisis than a stark public safety issue. The Washington Post reports that Klain is “tasked with coordinating domestic preparedness efforts and the U.S. military operation to help control the virus’s spread in West Africa.” He’ll report to Homeland Security adviser Lisa Monaco and National Security Advisor Susan Rice, the Postsays. But the Federal Emergency Management Agency is also a player. And the Defense Department has a major role. And because it is Africa, so does the State Department. And so does the Department of Homeland Security. Power in Washington is in direct relation to proximity to the president. So a “czar” operating from the White House exercises powerful influence over these departments, which have a measure of transparency and accountability under the law that the czars do not have. As Judicial Watch has reported, the Obama administration has named dozens of them across the executive branch. Many, like Czar Klain, are unconfirmed by the Senate, largely unaccountable to Congress, and often outside the reach of the Freedom of Information Act. That’s a troubling consolidation of power, and no way to run a republic. Congress followed our lead again. Bob Goodlatte (R-VA.), who chairs the House Judiciary Committee, sent a letter addressed to the secretary of state and the secretary of Homeland Security asking for details about this plan. “Please provide me any and all written memos or other documentation written by employees of your Departments regarding the formulation of a plan to allow non-U.S. citizens infected with Ebola to enter the U.S. to receive medical treatment,” the letter says. The committee is giving the agency heads until the end of this week to respond. There is one way President Obama can carry out this initiative. He can do this by offering foreign nationals a special parole. Under federal regulations, a parolee could be defined as an alien who is inadmissible to an inspection officer, but permitted into the U.S. for humanitarian reasons. Obama has already used this exemption for the illegal alien “minors” who illegally crossed our border. He could do this again, without notice or announcement, to open the door to foreign nationals carrying the deadly Ebola infection. So, as some argue about whether to restrict flights and visitors from Ebola-afflicted countries in West Africa, Obama plans to allow non-citizens infected with the virus into the United States. All the flight and travel bans in the world won’t address this president’s abusive use of power to allow aliens with Ebola into the country. I see nothing under discussion in Congress yet that addresses this clear and present danger. Rep. Bob Goodlatte, Rep. Louie Gohmert (R-TX), and some members of the Senate are on the alert and ready for action after Judicial Watch’s disclosure, but the rest of Washington is asleep at the switch. Check in with your elected officials, wake them up, and tell them to pay attention to – and act upon – Judicial Watch’s warnings of Obama’s reckless plans to endanger the public health. Lobbying – the act of attempting to influence decisions made by officials in the government, most often legislators or members of regulatory agencies. What I am about to show you is not some hidden government numbers and not what some may call “conspiracy theories”. The following numbers are publicly available and show just how far we have strayed from a country “by the people and for the people”. Lobbying has turned this phase into “buy the Congress for your people”. And of course Big Pharma is the number one single contributor. That comes as no surprise, after what I have shown you the past few entries. Officially, the health industry lobby dwarfs Commercial banks and air defense lobbying. Do you still think Congress votes on your behalf? Again, these are just the official campaign contribution for 2012. Of course all the large contributors expect to receive some kind of compensation…so the president owes, officially, almost $500 million in favors… and this is just the tip of the ice berg!